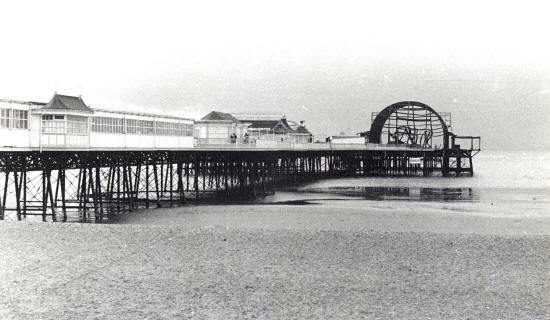 The 1974 fire, St.Annes Pier. A £1 MILLION mop-up began yesterday after a blaze destroyed a pier theatre and put a summer show out of business. Firemen were still dousing the smouldering remains of the unique building which erupted in flames on Saturday night. The blaze started an hour after two theatres at the head of the T-shaped pier at St. Annes had been cleared. During the performance, the 667-seat Pavilion Theatre was packed and the pier could have become a death trap --it has only one exit. The first wisp of smoke came front backstage atier the show as comedian Ken Platt and the cast of Comedy Playhouse were leaving. 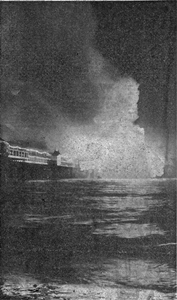 Within an hour, only the blackened steel skeleton of the wood-clad building remained. Firemen fought to save the Tyrolean Bar and theatre just 20 yards away as one of the Pavilion's famous twin domes crashed into the sea and an inshore lifeboat circled near the pier head. Last night a spokesman for the pier's owners said it would cost £1 million to build a new theatre, but they could never replace the priceless Moorish style Pavilion, which is listed as a building of historic interest . The 64-year-old theatre - visited last month by Princess Anne for a Yehudi Menuhin concert commemorating its builder's centenary had a valuable baroque ceiling decorated with 22 carat gold leaf. he smelled burning rubber-- and I cracked a joke about the sort of cigarettes he smoked. 'We didn't take it seriously until the lights went. Then we got up and groped our way to the stage door. It was very windy outside and a cloud of smoke swirled behind us as we opened the door.' Ken, 48, from Blackpool, reckons he lost clothes and personal gear worth about £400. 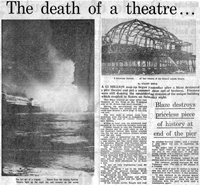 Pier company general manager Mr Rod Pothecary said: 'The loss of the theatre is a tragedy. 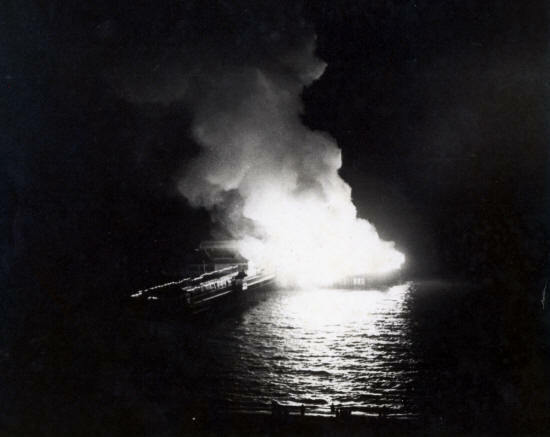 The 1974 fire, St.Annes Pier, viewed from the Majestic Hotel. Click to play the 60 second film footage. PIER bar manageress Mrs Jean Brown combed St Annes beach on her first summer's say away from work for years — and came back with one safe and a host of memories. The weekend's blaze at St.Annes Pier burned down the lounge bar, put Mrs Brown out of work and destroyed the treasures she had collected over 18 years in the job. Mrs Brown, of Highbury Road East, St Annes, spent the night watching the pier fire and at first thought nothing could be saved from her bar. Then she remembered the safe. complete with a week's takings, was fireproof. Early in the morning she went out to search the beach and finally managed to find the safe embedded in mud beneath the pier where it had fallen when the bar floor caved in. She persuaded a team of firemen to dig it out from the sand and drag it up the beach away from the debris to safety. And she has earned the praise of her bosses at Whitbread's Brewery. The safe lock was jammed but today experts were blowing it open at St.Annes police station and Mrs Brown is crossing her fingers that the money will have survived the fierce heat. season. Now she has memories but no job. And she says: "That bar was my life. I loved the work and still can't believe it is all over." 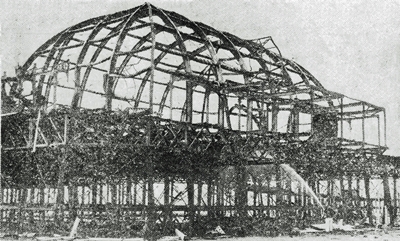 The skeletal remains of the theatre after the 1974 fire, St.Annes Pier.